It’s cold and flu season, unfortunately. We’ve each taken a turn with at least one minor cold already this year (we haven’t been on top of taking our fermented cod liver oil…even though I know better!). It’s not fun to be sick. But it’s also not safe to take over-the-counter cold and cough medicines. For starters, the OTC meds aren’t approved or recommended for children under 6. For another, they’re obviously suppressive in nature. Third, they have unpleasant side effects, like drowsiness. Who needs it? 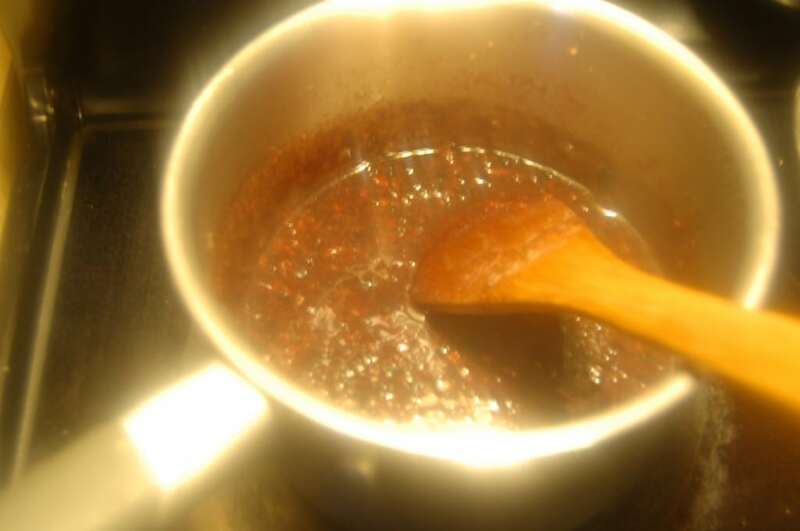 Instead, try out this homemade, herbal cough and cold syrup. It’s thick, sweet, and soothing, with lots of awesome properties! Put all the ingredients except honey into a saucepan. 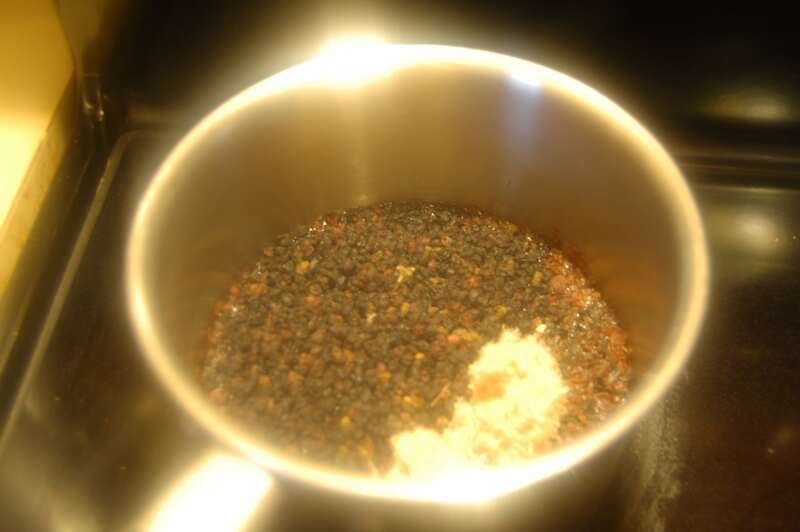 Turn it on and simmer on low until thick and syrupy, 20 – 30 minutes. Remove from heat and allow to cool for about an hour. Then, strain the mixture. Add the raw honey to the cooled mixture and stir together. Now you have a homemade, safe syrup! *Please remember that raw honey is not approved for babies under age 1. You may choose to use sucanat instead, in which case you need to dissolve it in the still-hot herbal mixture, if you are planning to give this to a baby. I would personally not give it to a baby under 8 months anyway. The reason that this works so well is because elderberry is known to have cold fighting properties, slippery elm soothes sore throats and coats mucous membranes (and aids digestive issues), fenugreek increases perspiration and helps the body clear mucus more effectively (and also aids digestive issues), and rosehips are very high in natural vitamin C. Combine it all and you’ve got major cold-fighting power! What’s your favorite cough/cold remedy? My favorite cold remedies are a neti pot and we drink Monavie every day. If we feel we're coming down with something we chug that. I'm going to pin your syrup on my pinterest, though. It looks great! Where do you purchase all your herbs and other home remedy items? I have check on Amazon but I'm just not sure what a good price is. Thanks! Also, I have been trying to fill my kids up on vit. C and D, probiotics, and enchiea (if I feel they are a little under the weather). So far no colds! I am wondering the same thing. I’m not sure where to get the top 4 ingredients. Whole foods? Whole Foods might have them. Mountain Rose Herbs usually does too (though I hear they may be sold out of some things right now). This looks like a great syrup. We make elderberry syrup all the time but this sounds like a good one when you need something a bit stronger. Thanks! This looks so much tastier than what I make! I slice up garlic, onion, ginger and black radish, pack a small jar half full with it and fill it up with raw honey. The honey draws the juices out of the plants and slides down around them until you have plant bits in a jar of liquid honey that gives you bad breath but knocks coughs out for the count. I actually (sneaky!) mixed a spoonful of it with mayo and a little mustard as a "ceasar" dressing on tonight's salad, trying to get ahead of the sniffles I've been hearing. Is this safe for pregnant and nursing moms? What's the shelf life of this syrup? I have made glycerites before, and you can store them quite a while, but I was just wondering if you have to use this one right away or can you store it in the fridge to have on hand during cold season? Looks like a great recipe! How long does it stay good and should it be stored in the fridge? How long does this keep? Do you need to store in the refrigerator? Thanks for this! How much should you take, how often, and how long does it last? Wonderful to have this recipe, I'm making a list for the health food store right now. My question is about dosage. How much do you give, and how often? Yes- I'd to know where you get your herbs from as well. The place I normally order from doesn't have the elderberries. This needs to be refrigerated, and will keep about 2 months. If you open it and it hisses like it's fermented, it's not good anymore. Doses — 1 tsp. for kids, 1tbsp. for adults. Herbs — I often but from http://www.mountainroseherbs.com or http://www.bulkherbstore.com. I made this a month ago, and it’s already fermented. I tried a small amount and it was carbonated, but tasted fine. According to Sally Fallon, honey ferments but never spoils. http://www.westonaprice.org/food-features/fermented-honey Wouldn’t a fermented cough syrup provide additional probiotics? I’m confused. I am not sure. Fermentation isn’t always beneficial, depends on the type of organism responsible for the ferment. I don’t know what that would be in this case. It does last about a month, and could be frozen if you don’t anticipate using it up that quickly. I just made this syrup and I am in the process of straining it. You didn’t mention that it is practically impossible to strain! I am pouring mine through my strainer and the syrup is so thick that I have to use a spatula to push it through. I am not even half way through and I have been working for 30 minutes! Is it supposed to be this thick? You could add a little extra water if you think it is too thick. It does take awhile though, while you mash the berries and herbs against the strainer, but 30 minutes sounds like a long time. I made this for my son, and have been giving him 1 tsp. Is this dosage every four hours or more often? I make my syrup with 40g thyme, 900ml water, a lemon (cut in half) tsp ciammon, 450g honey. You simmer everything apart from the honey for 20mins. You then strain and stir in honey. Hope this helps and that your family heals quickly! I just made this for me little boy and wondering if after a couple of weeks I could freeze this to pull it out when we need it again? I have not done that, but I don’t see why it wouldn’t work. Elloise I made the syrup you mentioned with the thyme cinnamon lemon and honey!! Smells amazing. Just wondering the dosage and storage of this syrup?! Is there anywhere else to get the dried elderberries? Bulk herb store has been sold out for weeks. Also wondering if you tried there double E immune her mixture? I haven’t tried their mixture, no. I think Mountain Rose Herbs has been sold out too. Do you have a local health food store? I am making this today! How often can you give it? Also all I could find is fenugreek seeds (Do I need to grind them into powder)? and Slippery elm bark powder, will this work? 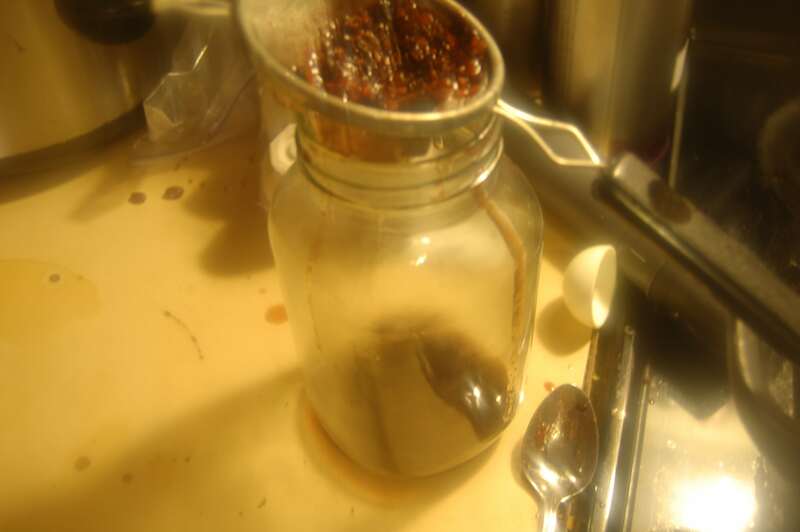 Would staining it before it cools help get through the strainer a little easier? I have fenugreek seeds, so do I need to grind these into powder? And also the slippery elm bark I have is a powder, will these ingredients work? I am still waiting on making this. I think I will just give it a go with what I have and see how it turns out. 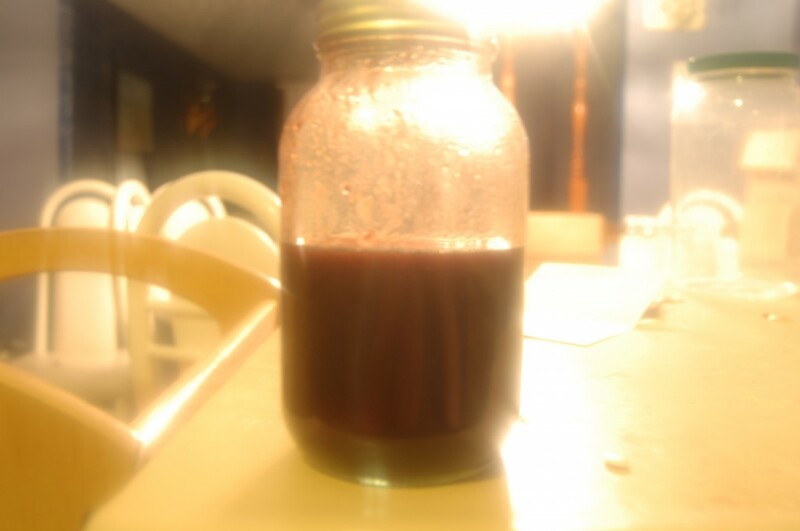 My elderberry syrup is great, on our second batch. It lasted about 2 months in the fridge! I have exactly the same ingredients: Slippery elm powder and fenugreek seeds. Did you make it with that? Did it work? Thanks! I have reactions to slippery elm. Is there something else I can use instead? Is it possible to run the mixture through the Vitamix instead of straining, or will that throw off the amount of ingredients? It should work, but I haven’t tried. Might be gritty or thicker. If I wanted to make it a nighttime syrup could I add camomile into the mixture?? If so, how much would be a good amount to add? Sure, you could. I might add about 1 tbsp. but I haven’t tried it. Do you use whole rose hips or powdered? You can try turmeric powder with warm milk , mix it and drink it regularly it helps to cure cough & cold and its completely ayurvedic so don’t worry about it.